Looking for a Myrtle Beach Photographer? 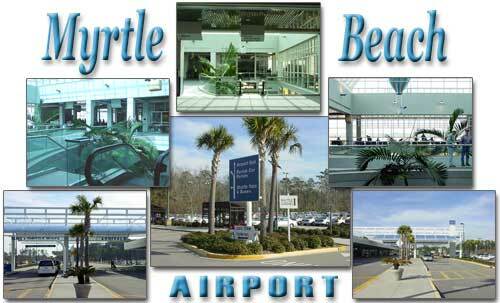 There are several regular airlines that fly in and out of Myrtle Beach on an annual and seasonal basis, including Delta, Continental, US Air, SpiritAir, and others. Sadly, our home-grown airline company, Hooters Air, as well as a newer company, Direct Air, has stopped all flights. Our booking engines allows you to search all airlines and find discounts on flights by either airline, duration of flight, number of layovers, or price. The car rental agencies at the airport are conveniently located at the front of the terminal by baggage claim. There are also several car rental companies located outside the terminal at different locations along the Grand Strand. There is a huge selection of Myrtle Beach hotels, motels, and resorts, with varying rates depending on the time of year and location of the property. Alternatively instead of a search, view the list of Myrtle Beach hotels on this site, which is updated frequently with the most current lodging discounts available; or you may check other local sources for discount hotels. For those that prefer to stay in condominiums instead of hotels, Myrtle Beach offers oceanfront condos as well as oceanview, waterway, and golf condos as rentals for your vacation. There are many sources of condos in Myrtle Beach, and we regularly update this section with the most current resources for condo rentals and family vacation rentals. Read more about Myrtle Beach Condos and North Myrtle Beach Condos. As evident by the number of local golf courses, there's a wide range of choices for avid golfers traveling to the Grand Strand. Golf packages in Myrtle Beach are offered by many hotels and resorts for those who enjoy teeing off at one or more of our 100+ challenging courses which cater golfers of all ages and skill levels. 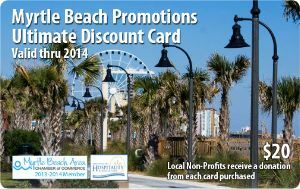 The Ultimate Myrtle Beach Discount Card! This discount card is only $20, with NO additional charges, and is shipped FREE of charge. Simply provide the name and address of where you're staying, the name under which the reservation was made, your arrival date, and your card will be waiting for you at the front desk upon check-in. Or, we can meet up at a mutual location for card pick-up. On the Paypal order form, in the Messages box, please note any special instructions needed. We reecommend that visitors try out this discount card before gathering up hundreds of coupons for different establishments. We believe it's definitely worth it, and will save you a great deal of money on your next trip to the area. There are over 1000 restaurants on the Grand Strand, with a wide variety of choices for every type of food and all budgets. There are more restaurants than any one family can eat at in a year, nevermind a week-long vacation. But the variety is here, and locals and visitors generally find a few favorites after sampling many. The largest and most comprehensive online guide to Myrtle Beach Restaurants, which covers all areas of the greater Grand Strand, has thousands of independent reviews. Other, smaller guides include the listing of North Myrtle Beach Restaurants and Little River Restaurants on the northern end of the Grand Strand. Copyright ©1999-2014. This site is not operated by nor affiliated with Airport Authority. All rights reserved.